Optimum, or more cost-effective performance is achieved with better knowledge. By careful consideration of the key factors affecting the durability performance of timber; industry, specifiers, and timber users can achieve durability performance for timber structures that meet or exceed their needs and expectations. 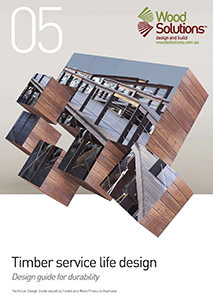 The Timber Service Life Design Guide provides information to assist timber industry employees, timber users and specifiers of timber to select members and structures with respect to their service life requirements. The information provided has been derived from historical performance and field and laboratory research and experience. The outcomes from a 10-year multi-million dollar ‘world first' research project to develop a probabilistic durability design method for timber have also been incorporated into this publication where appropriate. This guide gives building and construction industry professionals confidence in determining the service life timber in a wide range of applications, from sole plates to suspension bridges. More detailed information associated with timber performance for other hazards including fire resistance and chemical degradation should be obtained from other sources. The TimberLife Educational Software Program is a recommended companion tool to this guide.